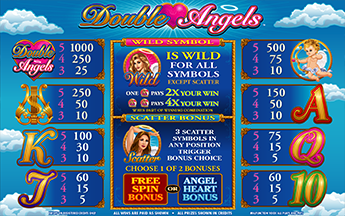 Welcome to Double Angels, a heavenly new game that bestows the ability to choose your own path. Pick the Angel Heart Bonus, where you may win up to 106x your total bet, or select the Free Spins route, where your Free Spins can be retriggered. By choosing the Angel Heart Bonus you get to select 3 out of 15 heart mystery prizes, and win up to 106x your total bet! There are extra bonus tiles; picking one bonus tile doubles the total award, pick two and it’s quadrupled! Choosing the Free Spin bonus awards you 12 Free Spins. Free Spins can be retriggered.